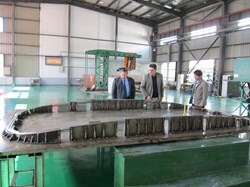 Du Shuangsong (ASIPP, right) shows a side correction coil winding trial to Paul Libeyre (left) and Arnaud Foussat from ITER. The correction coils are part of the ITER magnet system and they will play a key role in ITER's performance. The correction coils are a set of 18 coils inserted between the toroidal field and poloidal field coils and distributed around the Tokamak. Their function is to correct the error field modes resulting from geometrical deviations caused by manufacturing and assembly tolerances. Although much lighter and slimmer than the toroidal and poloidal field coils—and running a smaller current (10 kA)—the correction coils are larger in size (measuring up to 8 metres in width). 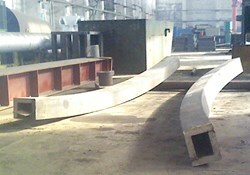 Consequently, the manufacture of these coils is not as straightforward as it would seem at first sight. Arnaud Foussat inspects a bottom correction coil winding trial. The difficulty lies first in the high precision required in their final dimensions, because the correction coils must fit into a narrow, predetermined space. Secondly, their unusual shape which is non-planar for side correction coils and planar (but banana-shaped) for the top and bottom correction coils presents another challenge. For this reason, the manufacture process must be carefully developed to ensure the manufacturability of these coils within specified tolerances, before advancing to the actual manufacturing stage. Two Procurement Arrangements have been signed by the ITER Organization for the acquisition of the correction coils, both with the Chinese Domestic Agency. One Procurement Arrangement is for manufacture of the conductor; the other for manufacture of the coil. The entire set of these coils will thus be built in China, from the conductor strand to the casing enclosing each coil. 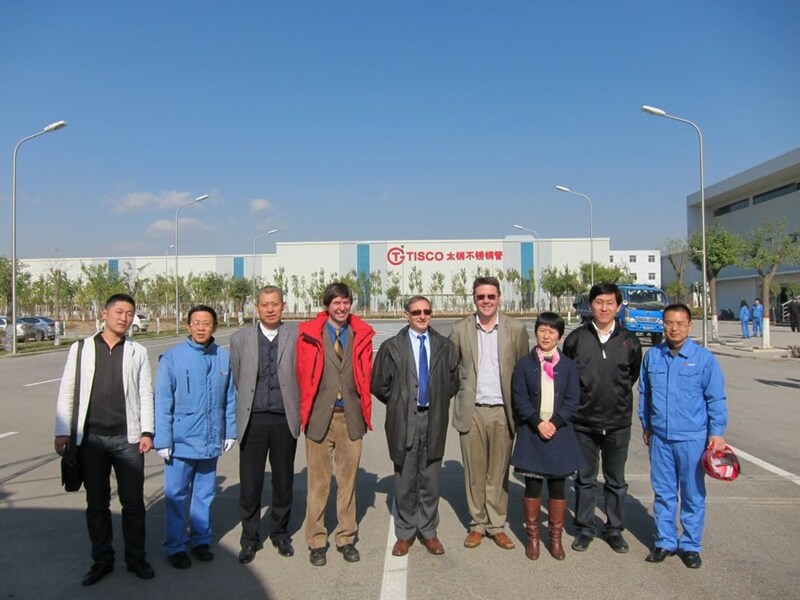 It is, therefore, not surprising that the ITER Organization has placed an R&D contract with the ASIPP laboratory in Hefei, Anhui (China), to carry out a series of development tasks in preparation for correction coil manufacture. 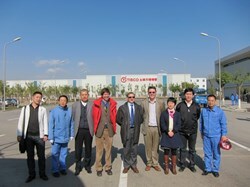 A visit to Tisco, the world's largest stainless steel producer based in Taiyuan, Shanxi province (China) on 8 November, organized by ASIPP (Wu Weiyue, 3rd from left, and Wei Jing, 3rd from right) with participation of the Technical Responsible Officer from the Chinese Domestic Agency, Li Hongwei (2nd from right), CERN metallurgy expert S. Sgobba (4th from left) and ITER representatives P. Libeyre (centre) and Arnaud Foussat (4th from right). The ASIPP laboratory is well-qualified to perform this work, based on experience gained from the construction of the EAST Tokamak. 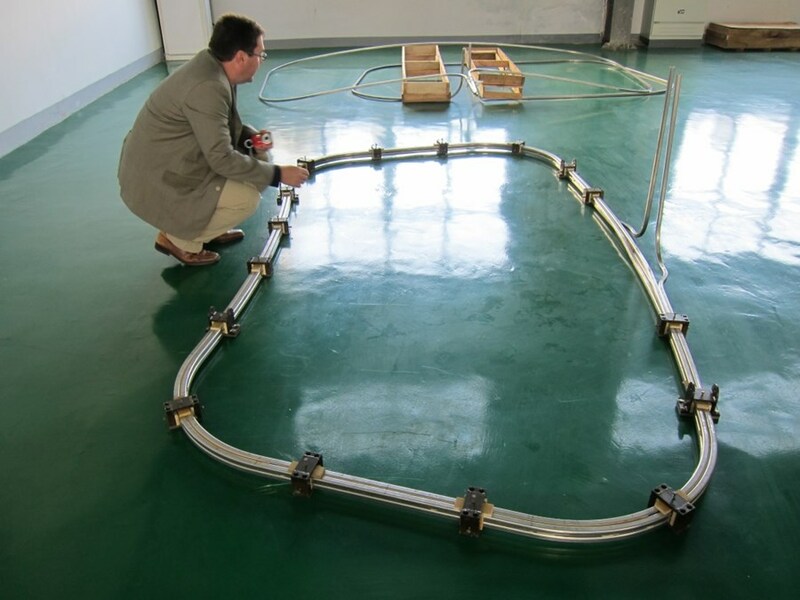 Furthermore, the conductors used in EAST are quite similar to the ITER correction coils; both are made of superconducting niobium-titanium (NbTi) strands cabled in a stainless steel conduit and both are cooled by internal circulation of supercritical helium at 4.5 K.
A visit to China in early November allowed ITER representatives to review and discuss the results obtained by ASIPP in the framework of their R&D contract. Worked performed included winding trials using dummy conductor lengths; resin impregnation of insulation mock-ups; terminal joint manufacture; and coil case manufacturing route investigation. The results from these trials and mock-ups will help significantly in the preparation of the manufacturing development plan, which is the next step in the execution of the Procurement Arrangement. Extruded correction coil case parts after tack welding and bending. For the moment, however, an important milestone for the Chinese Domestic Agency is the selection of the main manufacturing company for the correction coils. The selection process should be completed by the end of this year. Although the name of the winning company will not be known for a few weeks, there is no doubt that ASIPP is included in the nominee list by virtue of the strong involvement of Professor Wu Weiyue's team in the present R&D contract.